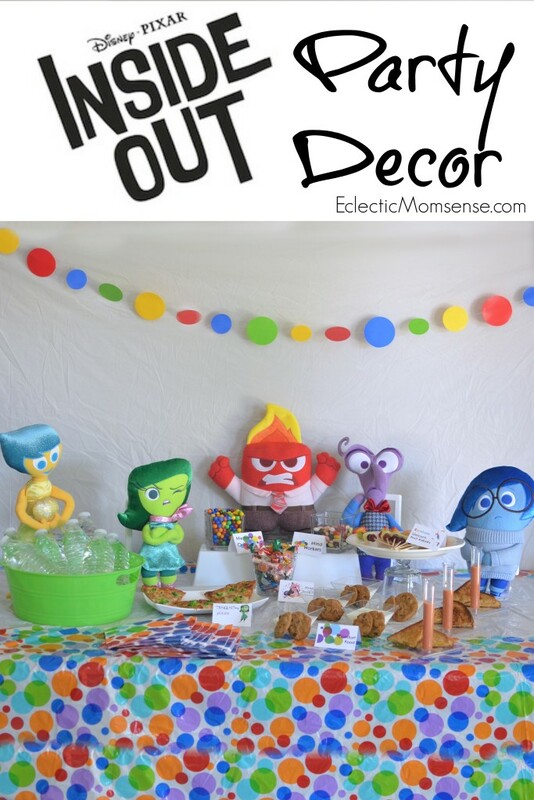 Raise your hand if you have seen Inside Out and fallen in love with all emotions! It was definitely an instant hit in this house. 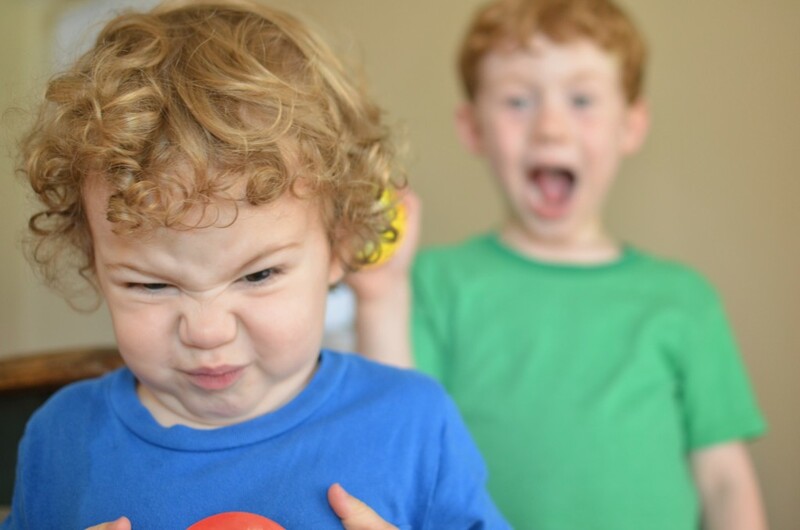 My boys immediately gravitated towards their favorite character emotion. My husband and I both agree sadness stole the show. To celebrate this amazing film and all the fun toys you can grab right now at Walmart we hosted a fun Inside Out party. Finding the perfect party decor was easy. The emotions in the film are represented by colors, bright vibrant colors. I took this and the concept of the memory orbs as my base for the party. I found basic polka dot party supplies in the party aisle and paired it with the exclusive Walmart plush toys. A plain white backdrop finished off the bright theme. I LOVE themed party food. I took inspiration straight from the film for food and treats. We started with Disgust-ing broccoli pizza. Next, we represented our feelings with a selection of comfort foods: milk & cookies and grilled cheese with a tomato soup shooter. I thought the little tubes looked like the gateway to long-term memory. Rainbow Unicorn from Riley’s dream sequence was represented by a fun fruit kabob; fun to eat and tastes good too! For treats we bottled up a bit of Bing Bong’s tears. 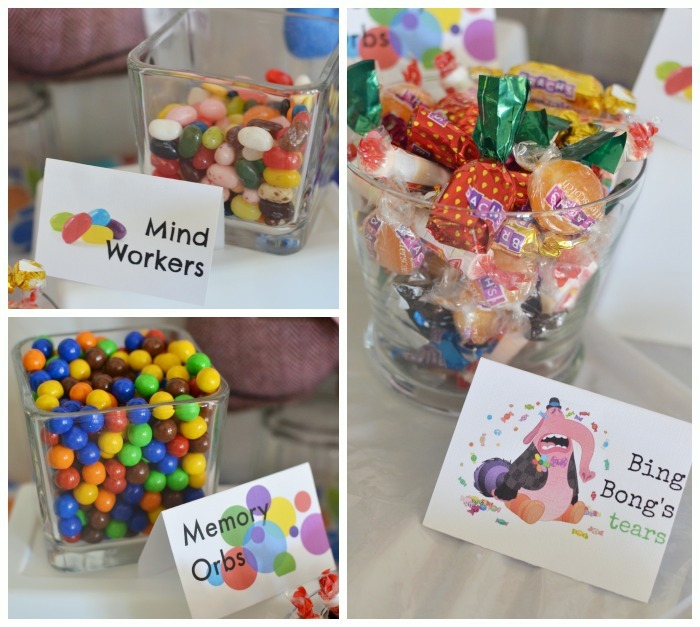 Sixlets were perfect memory orbs and my husband brilliantly suggested the mind workers looked just like jelly beans. There are so many possibilities. You can even grab Kellogg’s Inside Out fruit snacks at Walmart right now. 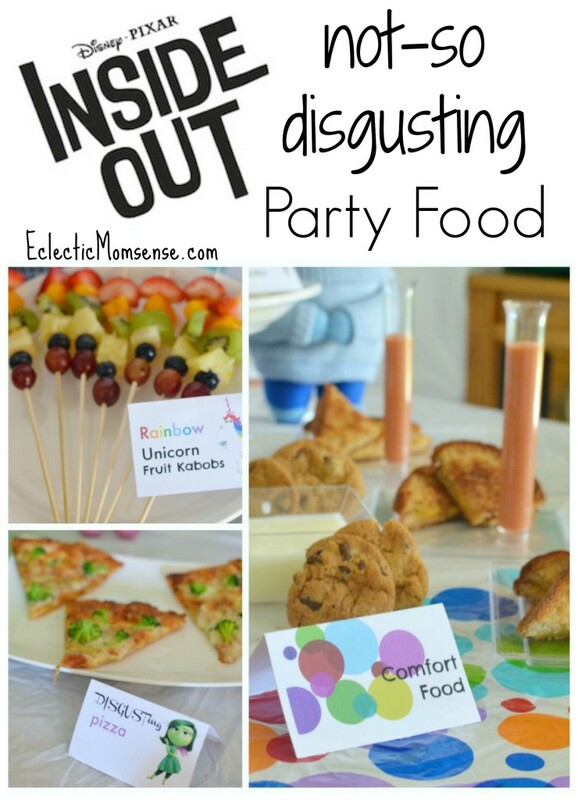 Grab these fun printable food tents here. 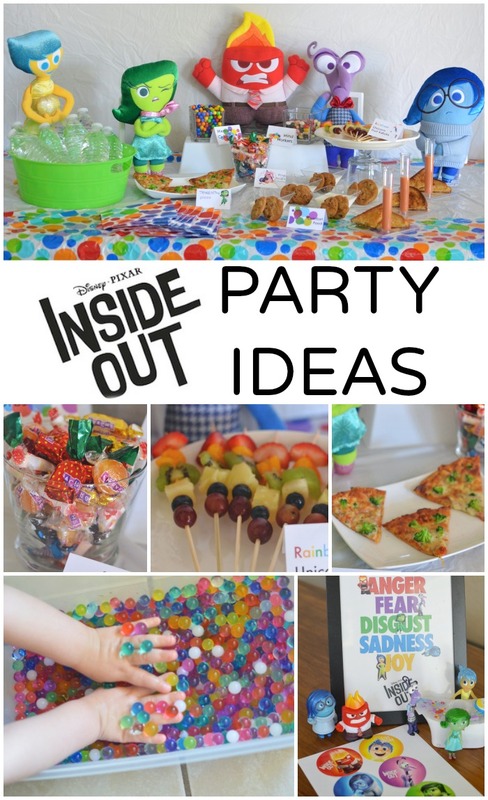 We had a couple activities for the kids to keep busy during the party and explore their emotions. 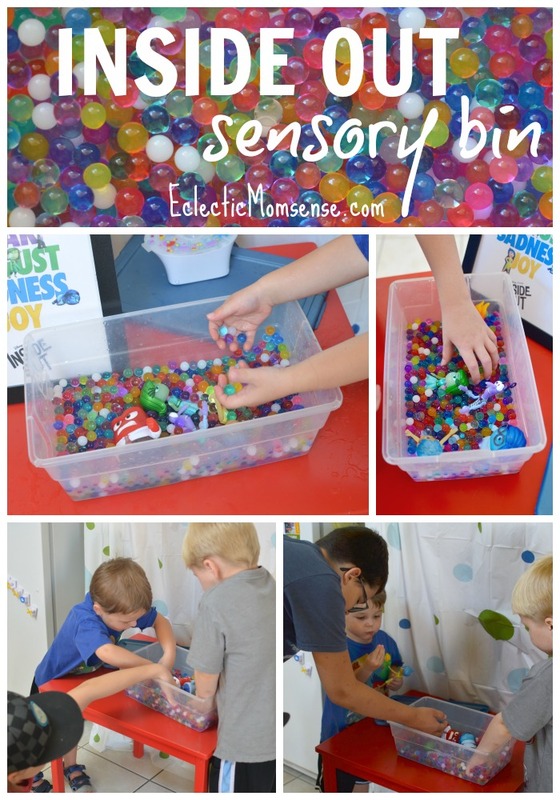 The hit of the party was the Inside Out memory sensory bin. The water beads looked just like the memory orbs and had a super fun feeling. The adults agreed it was a perfect relaxing idea, while the little guys enjoyed playing with all the toys in the memory dump. 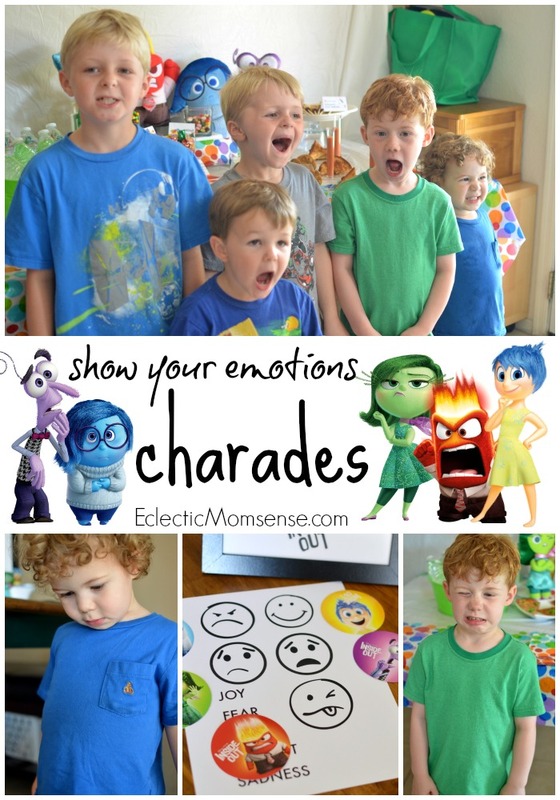 My boys have loved playing show your emotions charades. A couple cards and our best impressions have kept them busy on many an afternoon. It didn’t take much to get these boys showing off their best faces. 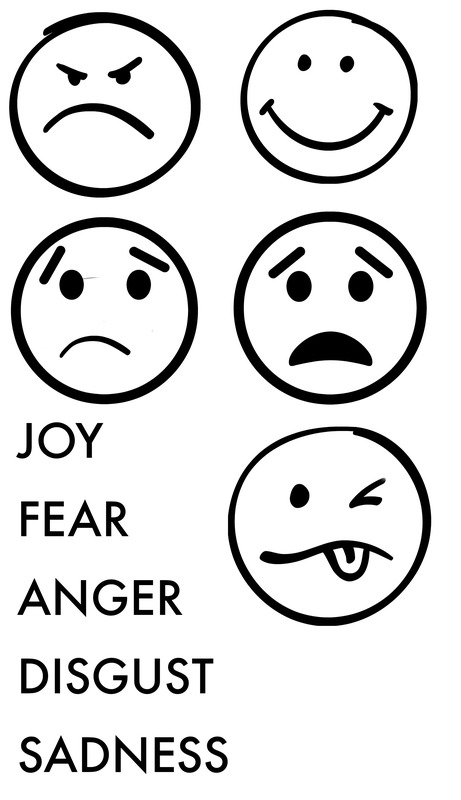 It was fun seeing all the kid’s as their faces contorted into fear, sadness, anger, disgust, and joy. You can print your own charade cards here, or checkout a mega matching game on Mom Endeavors with even more emotions. We are so blessed with our little tribe. 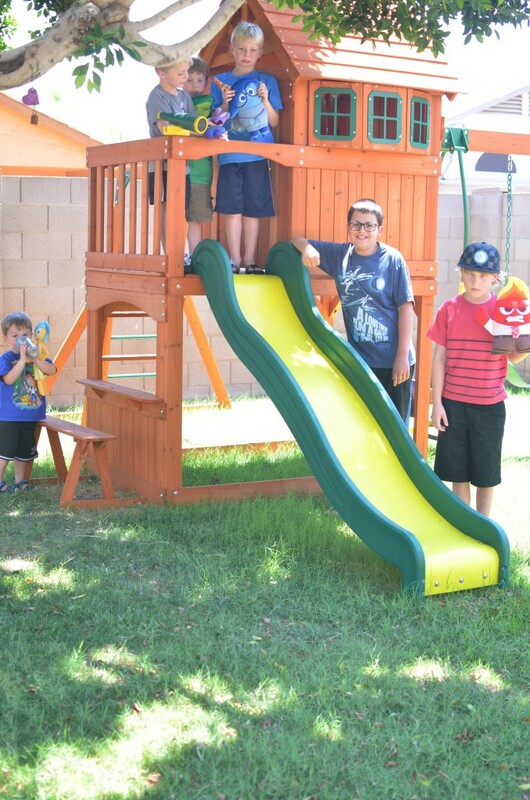 We could almost staff a baseball team with our crew of little men. What’s even better is they seem to get along pretty well. The older boys were such a good sport getting their hands dirty and exploring all the activities. By the end of the party they were having a little dance competition, lots of laughter and joy all around. Have you seen the film yet? 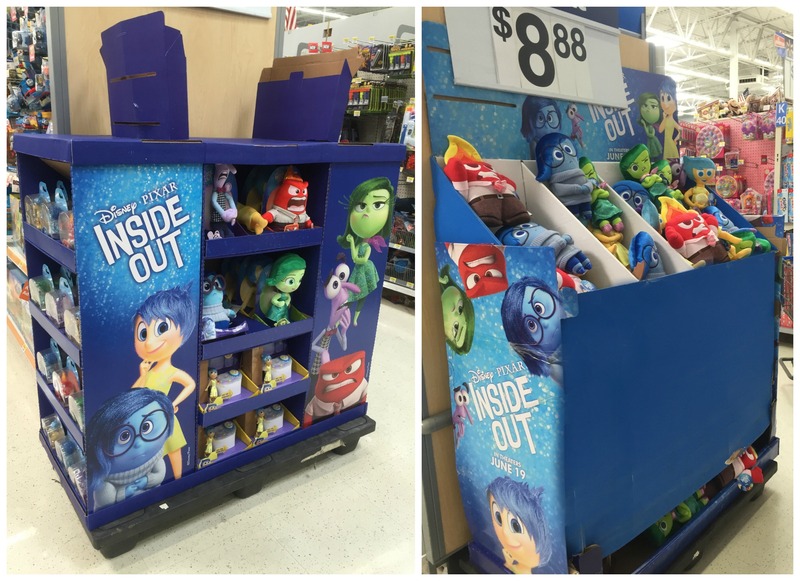 Check it out in theaters now, then bring the fun home with a great selection of toys and exclusive plush at Walmart. So much fun! The boys are still talking about those water beads! Hi Denise, I’m in the process of getting that post up. I’ll send an email your way once I have the .pdf uploaded with all the food tents. Can you send me the pdf of table tents also? Thanks!